PALMDALE – The city of Palmdale will host a Tail-of-Love event this Saturday at Yellen Dog Park. It’s happening from 2 to 3 p.m. Saturday, Feb. 9, at the Park, located at 5100 East Avenue S in Palmdale. The event is free and open to the public. “Join us for this free social event where four-legged community members come to mingle and play,” stated Senior Program Leader Joi Christy. A “kissing booth” will be available. Park staff and Yellen Dog Park PAWtrol volunteers will be on site. 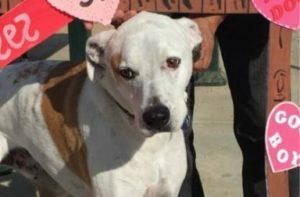 17 comments for "Tail-of-Love event coming to Yellen Dog Park"
“State of oblivion:” A complete failure to remember where he is or what he’s doing. Be aware of your surroundings. Where, oh where, does this article mention ribbon cutting for a shade tree? Come on people, read the article, then comment on the article. Just to bring you back to what the article is about: “Tail-of-Love” event at Yellen Dog Park. It isn’t the article that morphed. It is the comments. The dog social activity is a good idea. If there is a ceremony for a shade structure it is a stupid idea. Things must be very slow in Palmdale when the City Council needs a ribbon cutting to open the new shade structures at Yellen Park, thats right shade structures. Our City staff must be in tears over this kind of leadership or lack there of. I think “Tail-of-Love” is a wonderful free social event. Some people can never be satisfied. A ribbon cutting for a shade structure? Are you joking? What a waste of tax dollars. The next thing you know they will throw a parade for a new net on a basketball rim. SMH. Yeah, that ribbon budget has gotten way out of hand! Time to go back to string. Or, option B…maybe you need to just get a grip. It can’t be that much $ to hold a ribbon cutting. It seems like overkill. It’s a shade structure from crying out loud. I don’t think that holding a ribbon cutting costs much of anything, really. There might be a few city employees on the clock in attendance that could be doing something else, but other than that I don’t really see any costs at all. As to ‘overkill,’ this is Palmdale. I can’t really think of anything much in the way of park facilities that would be more vital and ribbon worthy than a shade structure around here. Swimming pools, I guess. Windbreaks. Our parks most definitely need windbreaks, maybe even more than they need shade structures. Most likely it’s Hofbauer et al who will be keeping a list of “accomplishments” to campaign on. We will likely see more of this kind of thing I suspect and it might look like overkill if they overdo it. I’ve asked around and can’t find anything that Hofbauer did himself to bring the Las Vegas/Victorville line to Palmdale. It was mostly Mayor Ledford who has done the heavy lifting over 26 years for that and other projects. So, if anyone has any specific things that Hofbauer has led the way on or has already accomplished bring it. Otherwise, it appears that his feat besides getting elected mayor has been to get the power agreement with Lancaster against the advice from the staff report that the county deal would have been better for Palmdale. It doesn’t count that he was merely on the council during the time the rail line was proposed. Apparently, Hofbauer has claimed he was a fightfighter when he just worked for the fire department. So, his honest is questionable. Do the dogs have to be on a leash? I’ve seen a number of dog owners at the doggy park bye paraclete with no leashes on there dogs. On the other hand, I thank those who abide by the rules so everyone (including our furry friends) are safe. I don’t take my dogs to events just as much because of a lot of dog owners who “follow the rules” as because of the few who don’t. So many people with small dogs seem to think that putting one of those extendo leashes on them and letting them run amok without any guidance or attention is okay, since it meets the letter of the rule. I have my dog under control, on leash or off, and if some snack on a string runs up to him while its owner is in a state of complete oblivion then both dogs will suffer for it. @TimScott what exactly do you mean by “state of oblivion” in your comment? Please clarify. Thanks. Usually it’s some sort of conversation, either with another person or on their phone. Meanwhile, their “harmless little dog” tears around in an area defined by the full extent of their reel out leash, that goes to like 25 feet. They know their dog is “around somewhere” because it is “leashed,” but they aren’t looking and don’t know specifically where the little darling is. They have no clue at all what their dog might be up to, whether it’s raiding a garbage can, wrapping leash around someone’s legs, or challenging some bigger dog to a fight that will be blamed on the bigger dog and its owner when the little darling gets eaten.